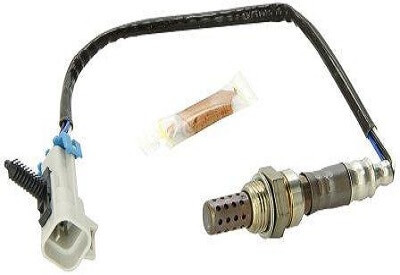 Believe it or not the Chevrolet oxygen sensor we discuss on this page is a reliable part number. With that said, this oxygen sensor wasn't designed to last for more than 200,000 miles worth of driving. What this means is that people are finding it necessary to replace the Chevrolet oxygen sensor at some point during the ownership cycle. I wanted to clear up a few things about this particular part number. This sensor currently holds the title for the best-selling oxygen sensor on Amazon at the time of this writing. It makes this undesirable list because of the volume of installations on the General Motors assembly lines. 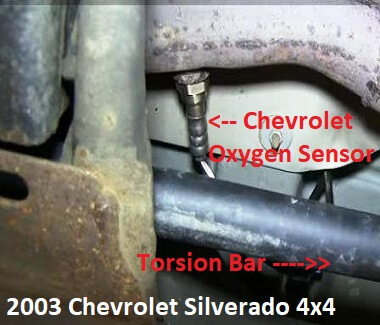 Long story short, they put this Chevrolet oxygen sensor on many different models and brands. You can find this part on 2005 Chevrolet Cobalt, 2004 Blazer ZR2 and on a 2003 Chevy Silverado with a 5.3 L V-8 engine. Before we move on I wanted to make another important point about this General Motors sensor mounted in the exhaust stream. On the Chevrolet Silverado and sport utility vehicles like the Suburban and Tahoe, this same part number fits all four positions in the exhaust stream. This allows you to move a new exhaust sensor around to different positions to help with pinpoint diagnosis. So that means they use the same oxygen sensors on bank one and on bank two. They also use the same part for both upstream and downstream positions. In other words, it's installed on a ton of vehicles and on some of those vehicles, they get four of them. This makes replacement parts cheap because of its wide spread usage. As a General Motors line technician for most of my career, I've seen a lot of professional mechanics replace oxygen sensors in error. Therefore, I recommend following the diagnostic tips laid out in the sections that follow. With that said, I wanted to mention a few things that I've learned about these emission system parts. In my last GM training session I asked the instructor how long an oxygen sensor lasts on a Chevrolet Silverado. Although he refused to answer the question he did say pay close attention to any 02 sensors 10 years or older and with over 150,000 miles. The instructor also insinuated that the older the sensors got, the less efficient they become at creating the voltage monitored by the vehicle's main computer. And this is what separates the oxygen sensor from the other computer monitored inputs. A Chevrolet crankshaft sensor uses a reference signal sent from the computer. The General Motors oxygen sensor creates its own signal in millivolts. The other thing to consider is that the days of paying over $100 for an oxygen sensor for a domestic automobile are over thanks to supply and demand. In the case of the Chevrolet oxygen sensor this particular part number fits so many automobiles that the demand for replacement parts remains extremely high. With high demand comes the opportunity for aftermarket companies to produce parts in huge numbers. Of course, this leads to lower prices and my final thought about O2 sensors for Chevy trucks. After you read the diagnostic section and determine whether an oxygen sensor failed or not, the next thing to consider becomes the current odometer reading and the total age of the truck. When replacing original equipment O2 sensors, on trucks beyond 10 years old and more than 150,000 miles, consider replacing all four sensors. Before we dive into the Chevrolet oxygen sensor diagnostic tips let me briefly state that the best way to diagnose problems with this component is with an inexpensive automotive scan tool. Unfortunately, you need more than a code reader. You can get a car diagnostic scanner with data stream capabilities for well under $50. With that said, even if you just have a tool that reads codes we can still make a go at diagnosing the system properly. When an oxygen sensor fails or provides intermittent operation, it should set a diagnostic trouble code. Both the upstream sensors located before the catalytic converter and the downstream 02 parts located after the catalytic converter have their own dedicated trouble codes. 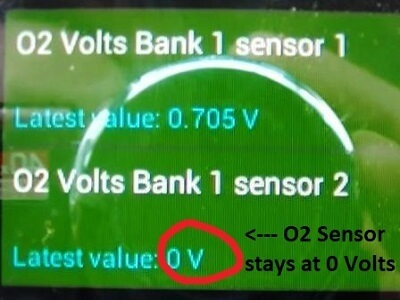 As an example, P0137 stands for O2 sensor circuit low, bank one sensor two. The P0133 diagnostic trouble code stands for O2 sensor circuit slow to respond. In other words, the codes set by defective oxygen sensors can help us locate the failed part or provide more information about the detected emission system malfunction. People ask me if you can diagnose an oxygen sensor without a scan tool. The answer is yes you can. You can use an automotive voltmeter to measure the voltage produced by the sensor. However, I prefer using the scan tool because I will get to pull the data stream up and see what the computer reads. I can then confirm that this matches what the actual voltage reads at the sensor. Nevertheless, the most common failure of an oxygen sensor that I run into is it stops producing voltage altogether. We call this a dead O2 sensor. When you pull these dead sensors up on the data stream they just read zero. Meanwhile all of the other exhaust sensors are dancing around with readings above and below 500 mV. When you locate an O2 sensor that stays fixed at zero, there's one final diagnostic step to take before you order replacement parts. Although the factory does an excellent job of protecting the sensor it does ride underneath the vehicle. In addition, these Chevrolet trucks see harsh service conditions like construction sites. Therefore, we need to check the sensor itself, the wiring and the connector to verify that no repairable external damage has occurred. If you have damage on the sensor side of the harness I still recommend replacing the part. Wiring repairs do not work well on oxygen sensor circuits because of the low voltage situation. Unfortunately, the oxygen sensor has gotten the reputation as the part to replace when the check engine light is on and you're not sure what to do. There are many situations that make it seem like the O2 sensor remains the root cause of the problem. Unfortunately, sometimes the exhaust stream sensor is reporting a situation caused by other defective components. The P0430 catalyst efficiency below threshold code provides a good example of a situation where owners replace the oxygen sensor instead of a bad catalytic converter. Let me provide yet another example of when you think you need an exhaust sensor, but it actually turns out to be something else. I had a 2003 Chevrolet Tahoe that set a fuel system lean code P0171. The driver replaced the bank one sensor one oxygen sensor on his own. When he showed me the old part you could see that the tip of the oxygen sensor was damaged by extreme heat. In this situation a code P0171 becomes an indication of an intake manifold leaking vacuum. With the additional air entering the combustion chamber the computer could not properly compensate for an out of whack mixture. A lean operating condition raises exhaust temperatures exponentially. In this particular scenario you still replace the oxygen sensor, but only after fixing the root cause of the vacuum leak. Replacing the Chevrolet oxygen sensor parts isn't a highly technical operation. When you swap out these parts on a pickup truck you can work yourself under the vehicle and get the job done without lifting it. Of course, it's nice to be able to walk under the truck while you work on it. Probably the most challenging part about the operation becomes actually breaking the sensor loose from its mounting location in the exhaust system. Obviously, extreme heating and cooling of this component almost fuses it to the metal. With that said, sometimes they come loose without any fight at all. In other situations you might have to take a torch to heat the area before you can bust it loose. I see people cutting off the old harness so that they can slide a box end wrench around the sensor. This might work. However, you can't beat using the specialized oxygen sensor socket available. There's no question that these Chevrolet trucks can last a long time. Unfortunately, they can give us trouble all the way through the ownership cycle. If you own one of these 5.3 L V-8 engines see why you might want to learn about the Chevrolet oil pressure problem. You should also familiarize yourself with the symptoms of a failed Chevy coolant temperature sensor.